It may be for only a brief few moments, but it is usually the kitchen where families seem to gather long enough to exchange their dreams, desires and to-do lists every day. In what is arguably the most functional room in the house, our lives become intertwined through the pulse of serving others. In this space that serves both function and fun, every element becomes important. A beautiful backdrop will only enhance the tasks taking place in this hardworking space. 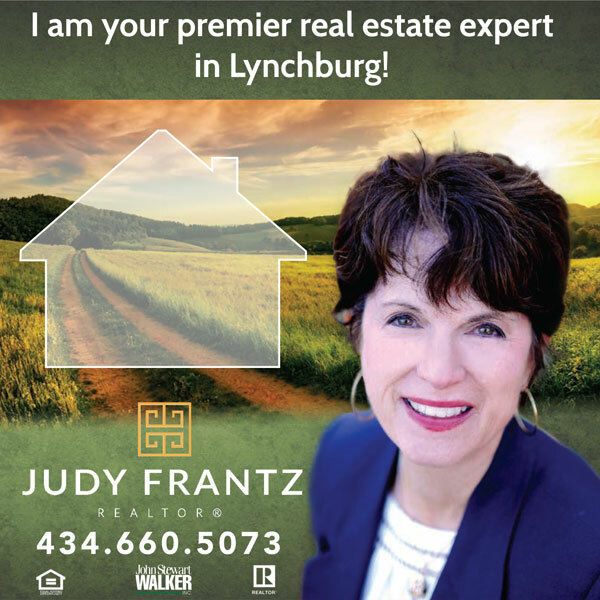 In the kitchen, the backdrop to all that happens is the backsplash—the area of wall between the stovetop or counter and the cabinets above, intended to protect against splashed liquids and soapy scrubbings. Since this architectural element is obvious to all who enter, a new backsplash can be a budget-conscious way to update a kitchen. When considering how to design a backsplash and what to use, it is reassuring to know that a few boxes of tile and a free weekend can bring a seemingly dead space to life. a glazed or an unglazed tile. Unglazed tile is derived from a quarry and is often more natural in color; glazed tiles are created by adding glaze after the clay has been heated, creating a beautiful bounty of colors. Porcelain tile is made of fine porcelain clays and fired at much higher temperatures, but the end result looks very much like ceramic. 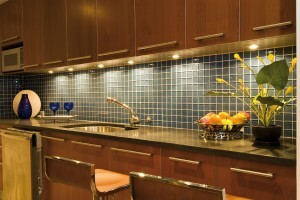 Glass tile is also a great option to use as a backsplash. 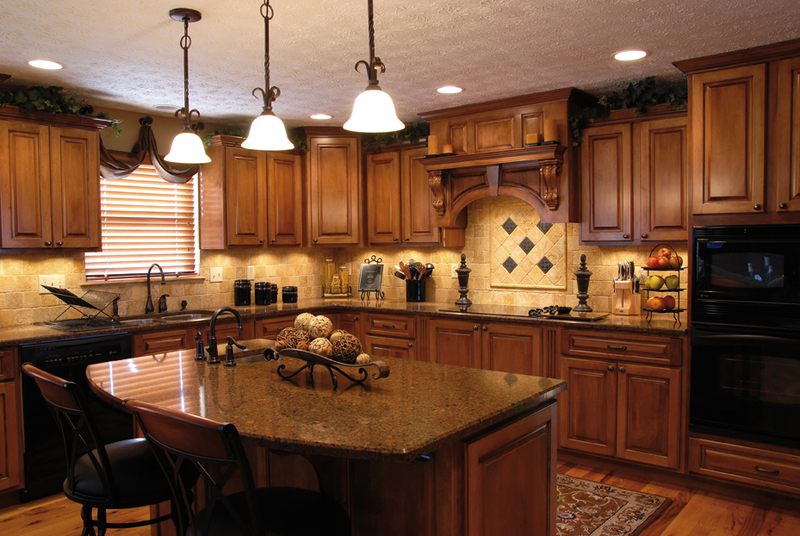 It is easy to clean and complements many countertops, such as granite. Natural stone tile, such as travertine or tumbled stone, is another option. One drawback to this selection is that it is porous, requiring resealing every 12 to 18 months to prevent permanent stains and discoloration. When selecting products, always bring a sample home first to make sure the colors blend with the rest of the kitchen, because lighting can make a huge difference. In a room that is primarily functional like the kitchen, elements with texture, pattern and color can really jazz the space up. A bold backsplash is one way to create a focal point. 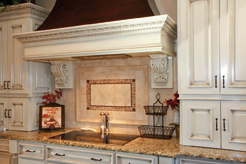 Complement the architectural elements already in the kitchen, such as counters and cabinetry. Tile in warm, rich earth tones could enhance the beauty of cherry cabinets and granite countertops, while iridescent glass tile could beautifully accent white cabinetry, achieving a fresh modern look. As with any surface, the amount of wear and tear to the area should be considered, which is why tile is such a popular choice. Cleanup is easy, and with consistent use of a sealant, the grout will remain stain-resistant. Having a beautiful backdrop to work with may be just what it takes to inspire more food preparation. Colors chosen can affect appetites, entice creativity and inspire conversation. A bright color may be an overwhelming choice to paint an entire kitchen, but it could make a bold and energetic statement in a small area like the backsplash. In addition to the assortment of colors, there is an endless variety of patterns you can use. Try to reflect your family’s personality—fun, whimsical, traditional, orderly. The backsplash can consist of simple rows of the same tile, or a scattering of colored or embossed tiles worked in here and there in the design. Patterns such as a harlequin in bright colors, stark black and white, or trendy yellow and grey, can also create an interesting twist on a classic design. Monochromatic color schemes can create a serene mood, helping to draw attention to the other elements throughout the space. Smaller mosaic tiles can add texture and interest without overwhelming an area. Or consider incorporating one major element in the middle of the design, above the stove—perhaps a large, painted tile, or one featuring an embossed object like a sun or leaf—surrounded by complementary tiles, like a framed piece of art. Other ideas? Consider laying square tiles on the diagonal, or subway tiles vertically. The possibilities are endless. When there is no natural stopping point at the end of a counter, or if you want to limit your design over your stove, you can create a tile border by using listello tiles. Listello tiles are usually rectangular and can be used to cap off an area, or for the transitional space across the stove top backsplash and under-cabinet areas of the kitchen that need a defined ending point. As with any space that draws us in, a stylish kitchen can be achieved without spending a fortune, but rather by incorporating personal elements and creativity. Backsplashes are an economical way to update a kitchen by injecting personality. As with each individual piece of tile joined together to create a beautiful design, kitchens are where lives join together, too. With such a beautiful backdrop that complements our lives, we will be more inspired to serve, as both family and friends gather and share their dreams over dinner.